Our Confetti Garden™ ‘Cotton Candy Surprise’ Combination is a combination of Petunia Surprise Blue and Petunia Surprise Blue Vein. 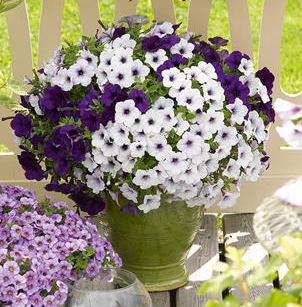 The Surprise series of petunias have been developed by Dummen U.S.A. to have larger flowers than many varieties, a wonderful trailing habit and vigorous growth. This particular flowering combo pairs Surprise Blue, which is a rich, saturated, royal purple, with Surprise Blue Vein, a prolifically blooming white petunia with venation extending outwards from the throat, a match to that of its container-mate. This sun-loving, eye-catching combo will also perform well in areas that receive partial or dappled late afternoon shade. Plant in hanging or standing containers, or in the landscape, where their trailing habit is allowed to show off. The plants in our 'Cotton Candy' plants are grown and shipped in fine quality growing medium and are guaranteed to arrive alive and ready to thrive. Comment: The Cotton Candy Surprise is such a nice soft combo and doing really well in the heat. I love the colors. Comment: I had some trouble with this one because I didn't plant it right away. It got too dry and almost bit the dust. But after a couple of weeks it has perked up and I think it's going to be beautiful!